Leading the way at the moment is Mexico's Citlaly Higuera who was a major favourite in the last edition of the Nuestra Belleza Mexico competition earlier this year but eventually finished as the runner-up. Now she is hoping to secure Mexico's third title at this competition later this month. Hot on her heals is Tayla Skye Robinson from South Africa who must be considered one of the strongest delegates this country has ever sent to Miss International. 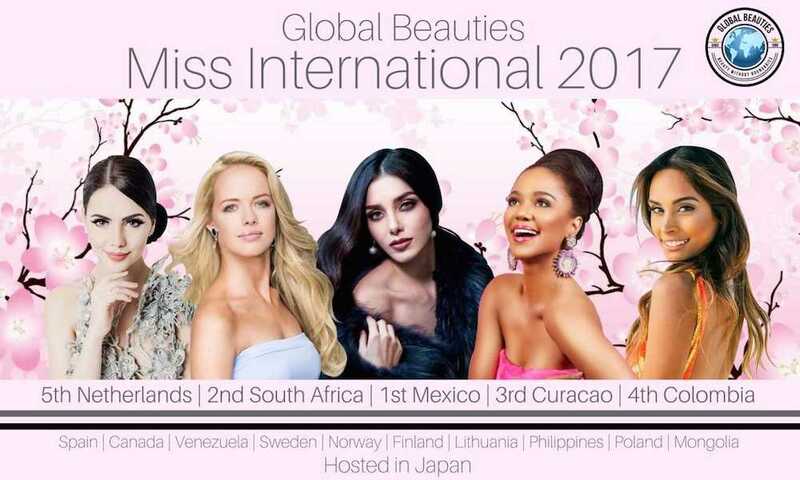 With only one placement in 1965, we think it is about time for the rainbow nation to shine at this pageant. Chanelle de Lau from Curacao was a big favourite at the Miss Universe competition earlier this year but failed to advance to the top 13. Curacao has also only placed once at this contest. Will they receive some love from the judges this year? Though many fans agree that Vanessa Pulgarin from Colombia might be better suited for the Miss Universe comptition, it would be foolish not to include her on our list. Colombia has done won the title on 3 previous occasions and they hoping for a fourth one this year. Rounding out our top 5 at the moment is Nathalie Mogbelzada from the Netherlands. She won the Miss Tourism Queen International title in 2015 and now she is hoping to add a Grand Slam title to her collection.